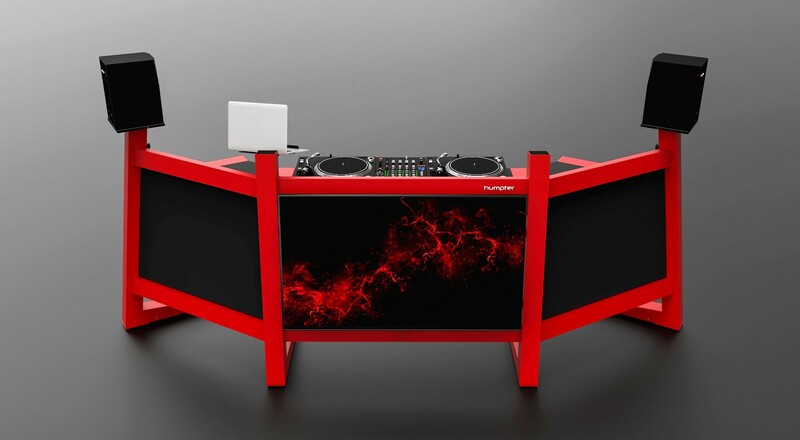 Here at the Humpter® office, we call this “the ultimate DJ stand” – our flagship product with a unique design using high-end materials, offering amazing stability despite its relatively low weight. The entire set contains 5 parts which are easily assembled, all without a single additional tool. The construction is modular and allows for easy expansion – it’s possible to connect virtually any number of these consoles to match your space requirements and use the PRO 60 PLUS attachment if angled sides are what you want. There are also additional shelves and flexible laptop holders which can be positioned freely along the frame, as well as a standard VESA TV mount to replace the front-facing panel. *Specially prepared aluminum alloy, subjected to many treatments improving its properties. **Personalization includes choosing the product color and placing individual graphics on it. This product is protected by law. Unauthorized reproduction of its structure and unauthorized use of the technologies protected by patent law contained in it are not permitted. Humpter® Console PRO is made according to the industrial design ID005255742-0003, filled with the Office for Harmonization in the Internal Market (EUIPO) in Alicante.